The Japanese have a word—tsundoku—for the habit of buying books only to let them pile up, unread. It’s a bad habit, and I’ve been cultivating it for at least 20 years. One of my current piles looks respectable enough. The books are held neatly between bookends on top of a bookcase. But this arrangement is deceptive: they are books that were bought long ago and have still not found their proper place, either in the case or out at a charity shop. A second pile is an honest untidy stack on the bedroom floor, blocking the way to a cupboard. Yet another is a secret pile, seen only by myself—the nine titles tucked away in the ‘Unread’ category on my Kindle. There’s quite a mixture of subject matter there—history, psychology, theology, literary criticism, poetry and fiction, along with a volume of Jeremy Clarkson’s proclamations that can only be described as ‘none of the above’. 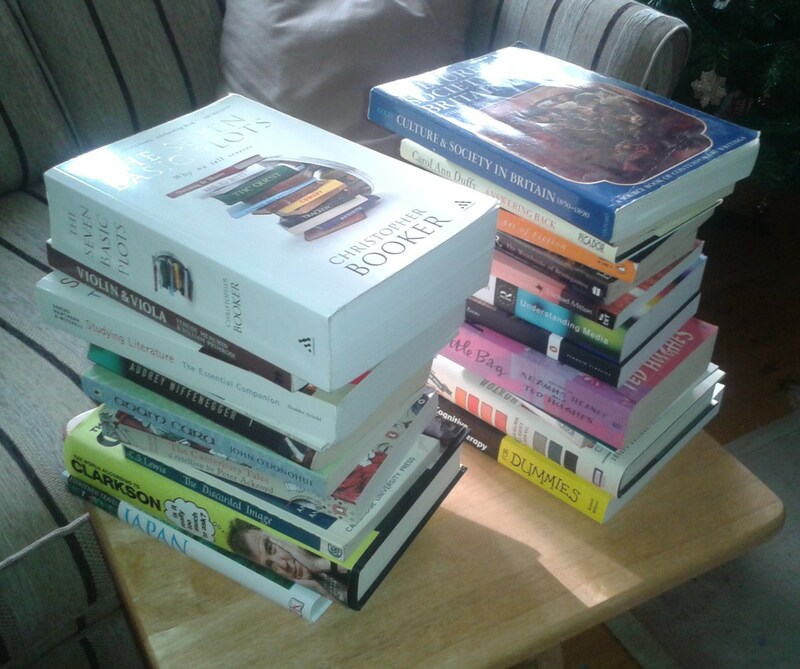 Why do I let tsundoku take hold? What stops me getting through the piles? I feel I have some excuse: I read books in my working hours as an editor, so of course I don’t want to spend all my leisure time doing the same. So why do I keep buying them? Much of the blame needs to be laid at the door of second-hand bookshops, which mesmerise me into collecting cheap and ‘really interesting’ stuff on a whim. Sadly, in my own less mesmerising living room, the magic often wears off. I now recognise fully that Culture & Society in Britain 1850–1890 was a mistake. So was Bede’s Ecclesiastical History of the English People. As for The Seven Basic Plots, with its 700 pages of densely packed type, I’m still convinced it will be a fascinating read, but so far it has seemed too big a mountain to climb. It’s not that I never read in my spare time. I’ve made my way through lots of poetry in the last year or two—Tennyson, Larkin, Graves and Hardy—and I loved Robert Galbraith’s The Silkworm and The Unfolding of Language by Guy Deutscher. But these books have ‘jumped the queue’, leaving the tsundoku piles to sink further into neglect. I think it’s time to break the habit. It’s clear that I don’t really want to read all these books. Over the next month I plan to read one chapter of each, keep the ones that still excite me and ruthlessly kick out those that now feel like a bit of a burden. There’s nothing like the happiness of being absorbed in a really good book—and if the Japanese haven’t got a word for that, they should have.